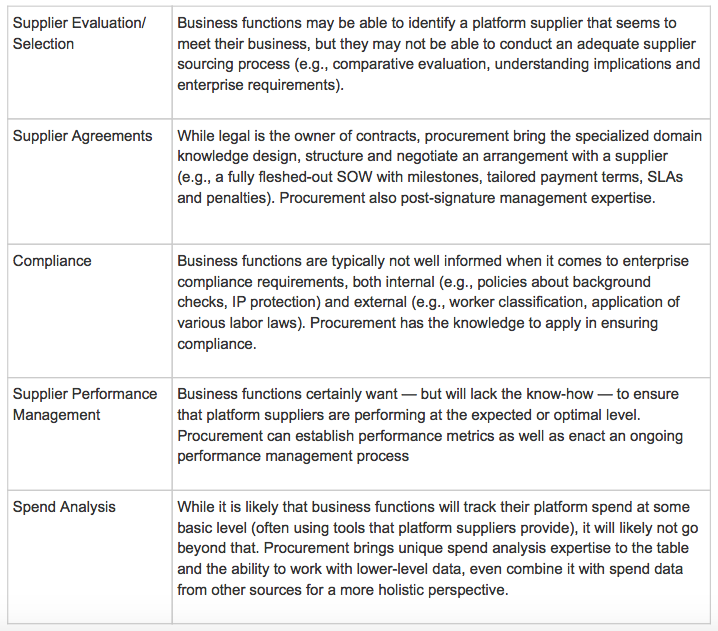 Independent Workforce and Online Platforms — What’s a Services Procurement Practitioner to Do? In 2019, services procurement practitioners in mid- to large-sized enterprises most likely have some awareness of — maybe even some level of interest in — independent contract workforce (ICW) and online work/service platforms (e.g., online freelancer marketplaces, contest/challenge crowd platforms, digital direct sourcing solutions). But for the most part, the new opportunities presented by platforms to source and engage ICWs are viewed as having an uncertain ROI, not being ready for prime time — or worse. There may be some merit to these claims, even today when gig workers and online platforms are becoming common fixtures in our everyday lives. And there is no question that, for procurement, it’s hardly a slam dunk. Procurement organizations — which typically operate with tight resource constraints and have other (bigger) fish to fry — may not be willing or able to spend the incremental time to investigate, let alone champion, such sourcing opportunities. In very real terms, pursuing an ICW and platform sourcing program is not an easy road to take. A recent Spend Matters poll, for example, found that the “lack of organizational know-how about how to programmatically scale the use of ICW” was the most cited “adoption obstacle” from the poll’s list of options; the second- and third-most cited obstacles were, respectively, “classification/compliance concerns” and “lack of C-suite understanding of why ICW is so important.” In addition, and perhaps not surprisingly, “lack of accomodation in procurement processes” was a close fourth. But at the same time, it seems that — even if it is early days — there is plenty of evidence that the use of ICWs and online platforms can deliver not only transactional efficiency savings (bill rate arbitrage), sourcing velocity and work-arrangement flexibility (think: on-demand and brief online freelance SOWs); it also provides access to new sources of “to-spec” labor, skills and expertise. The above mentioned Spend Matters poll found that the first, second and third most cited reasons for finding value in the use of ICWs were, respectively, “access to talent,” “direct sourcing” and “time-to-value,” followed by avoiding the time and transaction costs of a traditional intermediary. Hence, the dilemma: How can procurement departments and contingent workforce procurement practitioners play a role in advancing the use of ICW and online platforms despite the resource constraints they must live within, their perceived uncertainty around ROI and the internal obstacles they would face? 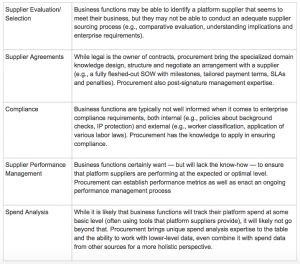 In 2018, we published “How Procurement Can Contribute to Platform Sourcing Initiatives: There Are More Ways Than One,” Part 1 and Part 2, to provide a focus, framework and suggestions to assist procurement organizations and practitioners in understanding various options and opportunities for participating in online platform/ICW initiatives in their respective enterprises. New conditions surround and underlie the use of platforms and ICW. For example, it’s all totally new, what needs to be done is not well understood and most initiatives will arise in grass-roots fashion within functional organizations of the enterprise. Though we also indicated that there is a range of different roles (Enabler, Supporter and Leader) procurement could assume, Supporter or Enabler were likely to be the most appropriate roles in the short-term at least. The Supporter role — representing the lowest time/resource commitment — is characterized as being “passive, but helpful” (for example, having an open mind and not being a naysayer, or willingly responding to requests for information). The Enabler role — representing a moderate, but still limited time/resource commitment — is characterized as being “proactive, and contributing” (for example, learning about internal customer needs, or offering to contribute some time and key expertise to support initiatives — perhaps as a member of a team alongside legal and finance). 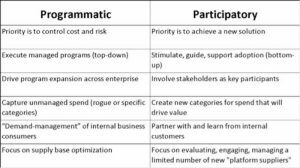 Again, these two roles, clearly aligned with the Participatory Approach, are what we see as the most likely roles for most procurement organizations/practitioners in initiatives in the near-term — and possibly in the long-term. Considering all of the above, despite the resource constraints, perceived uncertainty and internal obstacles, there may be a way for procurement departments and contingent workforce procurement practitioners to play a role in advancing the use of ICW and online platforms and in helping to harvest the potential hard and soft benefits that will accrue over time. For most enterprises, securing needed “to-spec” labor, skills and expertise, with the utmost efficiency, flexibility and speed, is always important — not only now in a “full-employment” economy in the U.S. It is not only necessary for enterprises to operate competitively, here and now, but also to be able to innovate and expand into the future. So even in a downturn, this requirement will remain important (if not more important) at the very least with respect to a broad range of contingent workforce use cases. So now might not be the period for procurement organizations to further defer the investment of (at least some) time into participation in online platform/ICW initiatives in their respective enterprises. Another reason for investing time could be the limitations of the established contingent workforce (temporary staffing) model/channel that have been becoming increasingly apparent as contingent workforce consumers’ expectations expand in relation to changes in the labor market and new options being afforded through the use of new technology. Enterprises have been increasingly recognizing that sole reliance on the temporary staffing model is not enough to address many business use cases that require various kinds of labor, skills and expertise, delivered with a higher level of efficiency, speed and flexibility than that which the time-tested staffing model affords. According to the most recent edition the annual Staffing Buyer Study (conducted by research firm Inavero and the American Staffing Association and Career Builder), the buyer NPS for staffing firms was 11% in 2018, down from 41% in 2009. In addition, for NPS Detractors (0-6 scores) in 2018, the top three reasons for their low scores were: “Not enough candidates to choose from” (32%), “Poor match of candidates’ skills/experience to my open position” (25%) and “Cost was too high” (17%). Not to sugarcoat it, there are resource constraints, perceived uncertainty and internal obstacles which — perhaps, understandably — discourage procurement organizations and practitioners from allocating time and resources to participating in ICW/online platform sourcing initiatives. But, as discussed above, there are really various ways of doing just that (with low to moderate time/resource commitments). Furthermore, there are a number of significant reasons for doing so --some of which have been presented above. 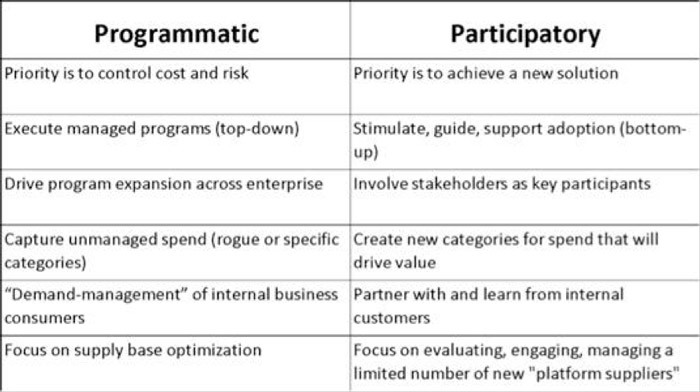 However, it will involve a bit of a paradigm shift insofar as it requires adoption of a Participatory (vs Programmatic) procurement frame of reference. In that context, participation is not an all-or-none decision, but rather a gauging of the type and level of commitment to important initiatives where procurement will not bear the weight of driving and managing a program or a strategic sourcing project. Framed that way, the risk-adjusted ROI of participation (now a variable dependent on procurement's calibrated choices) can be positive, with the additional result of reducing uncertainty and the risk of being behind the eight ball at some point in the coming years.